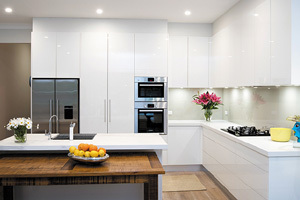 Seabreeze Kitchens has been a market leader on the Northern Beaches for over twenty five years, having manufactured and installed over five thousand kitchens they enjoy a repeat and referral business rate of over seventy five per cent. They have built a reputation that is second-to-none based on a passion for excellence, inspirational design, superb craftsmanship and meticulous attention to detail. 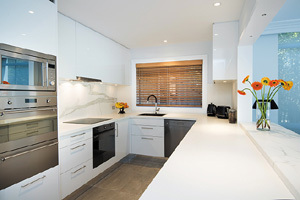 Each Seabreeze Kitchen is created with four cornerstones in mind: quality, style, practicality and design. 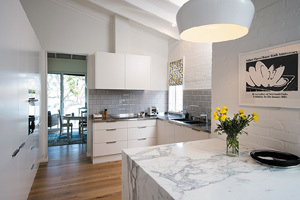 Walking into the stunning showroom at Seabreeze Kitchens on Harbord Road you can instantly imagine your new kitchen coming from there. Each of the 10 designs on display shouts ‘superior quality.’ Elegant, smooth bench tops in Caesarstone, Quantum Quartz and SmartStone. Family- friendly cooking islands showcasing the latest induction cooktops from Swiss manufacturer V-ZUG. Beautifully crafted doors and panels made from laminate, polyurethane, timber, veneer and other exotic materials. Splashbacks in varying hues of toughened glass and the latest kitchen trends from Europe. 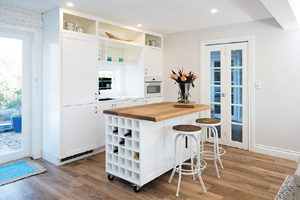 Once a design has been created and the kitchen finishes and appliances have been chosen, you will be able to view your new kitchen using the very latest computer aided drawing techniques. On approval of a design you will be provided with a written quotation. Seabreeze kitchens are always competitive but are not price driven - they simply want you to have the very best kitchen your budget allows.